We kick off the New Year with a busy day at Flemington - five runners and hopefully some winners amongst them to welcome 2014 in celebratory style! The first of our Flemington runners is Crimson Lady who we are hoping can put in an improved showing in the second event of the day, the Riverside Handicap. Racing well below her best over longer trips of late, Crimson Lady drops back to 1400m on Wednesday and Michael Moroney is hoping that is the key to her. "She has been disappointing," he conceded, adding that if the daughter of Volksraad didn't show a bit more retirement may beckon. "But hopefully it is just a matter of distance," he said, noting that Crimson Lady's most recent good showing was in a 1400m race at Caulfield in late September. Next up for Ballymore is Shenzhou Steeds who resumes in the fourth race, the George Watson Handicap. Having his first run since mid-July, the talented six-year-old has pleased us leading into his first up assignment. "He is forward enough," Moroney said, adding that he is pleased with Shenzhou Steeds' barrier draw (gate one). "He should acquit himself quite well," he said. 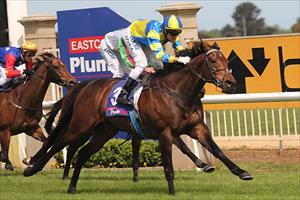 Contesting the following race, the Listed Bagot Handicap, Flashy Fella is being tried over 2800m for the first time. Runner-up over a trip in the Western Australian Derby, Flashy Fella was a solid fifth over 2000m at Flemington last start and Moroney is looking forward to seeing how the Thorn Park five-year-old performs over distance. "He has a nice draw (barrier four) which should give him a soft trip - so it's a good chance to see if he does stay." Garud meanwhile is back in distance in the Byron Moore Handicap, having just missed a placing in the Werribee Cup. "He just didn't get the 2600m there," Moroney said, noting that the High Chaparral gelding has run some very handy races at the 2000m of Wednesday's race. Perhaps our best New Year's Day chance is Murcielaga (pictured) who lines up in the eighth event, the Williamstown Handicap. Also back in distance, he is already a two times winner at the 1400m and Moroney has been pleased with his work of late - "he has freshened up really well," he said, adding that at his latest run he may have just been "a bit over the top." Ballymore Stables thank all clients and fans for their support over the past twelve months and wish everyone all the very best for 2014, Happy New Year!